The Leafs were given almost no chance against the Bruins heading into the playoffs. And after Game 1, it looked like the naysayers were right. But the Leafs showed life in Game 2, and played at a high level. In fact, for the rest of the series the margin of difference between the Leafs and the eventual Eastern Conference champions was practically non-existent. James van Riemsdyk, one of the few Leafs with playoff experience, went after the Bruins as if they stole his dog. As the series wore on more and more players took a cue from JVR and looked comfortable with the elevated intensity. 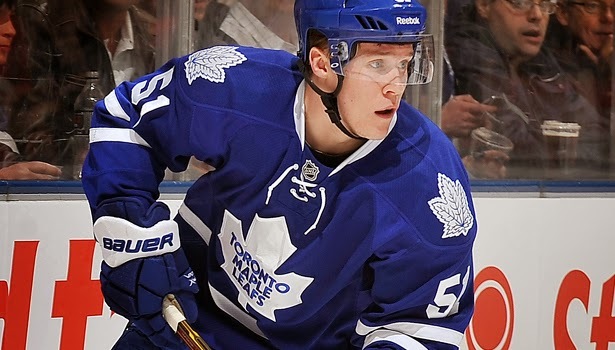 Jake Gardiner played like he was a 10-year veteran, even though he hardly played in the NHL all year. Cody Franson looked solid playing top-4 minutes and James Reimer was pulling out timely saves, including an unbelievable toe stop on Patrice Bergeron. I watched that toe save on seedy jungle internet and thought it was a glitch in the matrix. Most importantly, the much-maligned Phil Kessel was more productive against the Bruins than Sidney Crosby, Evgeni Malkin, James Neal, Patrick Sharp, and Marian Hossa were combined, silencing many of his most vocal critics. He was even more productive against the Bruins than either Jonathan Toews or Patrick Kane. Of course all the positives came crashing down with 10 minutes to go in the third period of Game 7... but let's move on. The Leafs managed to win 26 games during the regular season, but didn't really inspire confidence in many of those games. In the playoffs they transformed into an entirely different team. If they start the 2013-14 season closer resembling the team that pushed the Bruins to the limit, rather than the one that rode a shy-high shooting percentage during the regular season, the Leafs are for real. James Reimer set the franchise record for save percentage last season, and when Ben Scrivens came in to provide some relief the Leafs were still plenty competitive. That's a huge improvement from the years of no goaltending. That's why it was somewhat curious to see the Leafs go out and spend assets on an upgrade in net. But what's done is done, and to be fair, Jonathan Bernier should make the goaltending better, even though I'm not convinced he's an upgrade over Reimer. Last season Bernier was 11th in the league in even strength save percentage (.932), better than Reimer's .924 mark (although Reimer has been better at even strength in his career). Reimer's overall save percentage should dip somewhat next season, as last year his record-setting save percentage was buoyed by an unsustainably high .920 save percentage on the penalty kill. So it will be good to have Bernier to battle with Reimer for the No. 1 spot, even though he isn't coming over with the LA Kings' defence in front of him. And now the Leafs have one of the best young goaltending duos in the league (ESPN's Craig Custance ranks the Leafs' tandem as fifth best in the legaue). Randy Carlyle didn't believe Jake Gardiner was NHL-calibre last season until injuries forced his hand and he had no choice but to play his third best defenceman. Gardiner was then playing over 20 minutes a game in the playoffs, pretty good for the guy your coach sees as a spare part. There is no way Carlyle can deny Gardiner ice time again, not after it was so blatantly apparent during the playoffs that Gardiner belonged. He is easily the Leafs' best skater and is calm with the puck in his own end, neutralizing the opposition's forecheck in a way reminiscent of vintage Tomas Kaberle. By the end of the playoffs I was more comfortable with Gardiner and Franson on the ice than Dion Phaneuf and Carl Gunnarsson, mainly because of the ease in which Gardiner got the puck out of the zone. 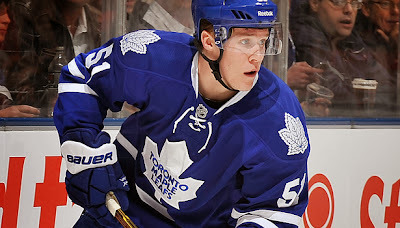 Simply adding Gardiner to the back-end can go a long way in improving a porous defensive unit. Sure, he's a high-risk player, but he pushes the play forward better than any other Leafs defenceman, and his skating often makes up for the defensive mistakes he makes. The two biggest concerns facing the Leafs last season—the goaltending and the penalty kill—turned into their two biggest strengths. Randy Carlyle and staff managed to turn around a putrid penalty kill that languished at the bottom of the league for years. Even if Carlyle coached the Leafs to 20th in penalty kill percentage it would have been a victory. Instead, Carlyle transformed the Leafs' short-handed unit into the second best in the entire league. The personnel that made the team so good short-handed last season will be back, and adding Dave Bolland adds another capable penalty killer to the group. Don't let self-righteous fans of other teams talk down to you. Remember, you are a Maple Leafs fan, and until proven otherwise are a fan of a playoff team. Hold your head high, and feel good about yourself. Lord knows feeling good about yourself and Toronto sports is not a long-lasting marriage, so enjoy it while it lasts. The Leafs were the sixth highest scoring team in the league last season, thanks in large part to converting on 10.56% of their shots at even strength. No team has been so efficient at converting shots to goals over the past five years, not even the 2009-10 Washington Capitals, a team that shot a blistering 10.39% and had Alex Ovechkin score 50 goals and Alex Semin score 40. The next season the Capitals scored on only 8.1% of their shots at even strength, dropping them from 318 goals and 54 wins to 224 goals and 48 wins. Unless the Leafs have stumbled on a secret way to create high-quality scoring chances without the luxury of top-tier players, the likelihood of Toronto repeating their 2012-13 performance is almost zero. If the Leafs shot more like the 2011-12 version, a team which was still in the top 10 in shooting percentage and scored on 8.47% of their shots, they would have ended up with 20 fewer goals in 2013. That doesn't sound like a lot, but would probably mean around six fewer wins and another year outside of the playoffs. The Leafs need to be better at creating chances in 2013-14, or at the very least find a way to feast on the power play (14th in the league last year at 18.7%). Otherwise, Toronto will struggle to score enough goals to make up for their defensive deficiencies. It feels stupid to criticize the coach who led the team to its first playoff appearance in almost a decade, but here we are. Carlyle did a lot of good for the Leafs last season, most importantly fixing the penalty kill, and was a pretty good tactician (his idea to get Phil Kessel away from Zdeno Chara by using Matt Frattin as a decoy in Game 2 against the Bruins was brilliant). But his roster decisions were baffling. From turning Mikhail Grabovski into a checking centre, his inexplicable love for Bozak, and his insistence on two face-punchers, the roster was a disaster. The Leafs succeeded in spite of many of Carlyle's decisions, and it wasn't until injuries forced Carlyle into icing a better version of the Leafs did the team look legitimately good. The optimist in me wants to think Carlyle just needed some time to figure out his roster, so the slate is wiped clean, but I'm eying him suspiciously. The Leafs weren't a very good defensive team last season, conceding a ton of shots and getting bailed out by great goaltending. There was a pressing need for a No. 2 defenceman to play with Dion Phaneuf, but the Leafs were only able to add Paul Ranger in the off-season. Ranger is a great lottery ticket signing, as he's cheap and has a history of strong top-4 play, even though that was four years ago. At centre, the other area of weakness, the Leafs probably got worse. Dave Bolland is a good addition to play a checking centre role on the third line, but axing Mikhail Grabovski to keep Tyler Bozak was a huge mistake. Apart from last year when Grabovski was buried in the defensive zone, he had been one of the league's best second-line centres. Now he plies his trade in Washington, while the Bozak experiment continues to bring down the Leafs' first line. At least Nazem Kadri should get more minutes than he did last year, which makes the sting of Grabovski's departure somewhat more palatable. Still, it's hard to see the Leafs as stronger down the middle, and teams that aren't strong at centre generally don't make deep playoff runs. The Leafs were outshot last season 32.3-26.3, the second-worst mark by a playoff team since 2000-01. In close situations at even strength, the Leafs only managed to control 43.8% of the shots. Only the Oilers were worse in 2013. And over the last five years only the 2007-08 Atlanta Thrashers were worse (43%) than both the Leafs and Oilers. Teams that fail to control the shot clock generally perform poorly, and no team that has ever done so badly controlling the puck made the playoffs until the Leafs did last season. That is one of the reasons some are predicting the Leafs miss the playoffs in 2013-14. Because teams that can't control the play usually find themselves at the bottom of the NHL standings over 82 games, it is dispiriting to know crappy puck possession teams don't usually magically improve from one season to the next. So unless the Leafs can maintain their solid goaltending (probable), their great penalty killing (hopeful), and their elevated shooting percentage (almost impossible), they will be a worse team in 2013-14. By re-signing both Colton Orr and Frazer McLaren, Dave Nonis ensured the Leafs would ice two goons in 2013, at a time when more teams are choosing to dress none. The two face-punchers created a dead zone on the fourth line last year, forcing Mikhail Grabovski into taking the league's toughest defensive assignments which killed his offensive production. The same fate awaits Dave Bolland this year, and although he's better suited to a defensive role than Grabovski, he's not going to be able to contribute much offensively. The addition of the Detroit Red Wings, who are consistently excellent despite how old they get and who they lose, does not make divisional play any easier for Toronto next season. Tampa Bay is going to score goals in bunches, and that's not even considering the impact rookie Jonathan Drouin can make. If they can get some goaltending from Ben Bishop, watch out. And it's hard to believe Florida can be anywhere near as bad as they were last season. Even the Buffalo Sabres, probably the biggest collection of scrubs in the division, have already done major damage to the Leafs. Making it back to the playoffs is going to be a fight all season long. In order to be guaranteed a playoff spot under the new divisional alignment, the Leafs will have to finish third or better in the Atlantic Division, which is exactly where they would have finished if last year followed the new format. Otherwise, the Leafs will have to battle for a wild card spot with some good Metropolitan teams, including the rising Islanders and Blue Jackets. When the Leafs' 18-wheeler fell off a cliff in 2011-12, it happened after 53 games. Since the Leafs only played 48 games last season thanks to the lockout, there is no way of knowing whether a similar fate would have befell last year's squad. Even though the Leafs made the playoffs last season, the fact remains the franchise hasn't had a playoff-calibre 82-game stretch since 2003-04. Before proclaiming the bad days are over reserve judgment until the Leafs get through a full season without calamity. Besides Joffrey Lupul, the Leafs managed to avoid the injury bug last season. And Lupul, who many are counting on, hasn't played more than 70 games since 2008-09. Now he's already had to sit out much of the pre-season with back spasms. On a team level, injuries are generally pretty random, with the teams getting hit worst by the injury bug shifting from year to year. I'd be wary of the Leafs' relatively injury-free luck lasting. The Leafs currently sit over the salary cap, and juggling a full roster will be nearly impossible to start the season thanks to David Clarkson's 10-game suspension. Dumping Trevor Smith in the minors and carrying minimal extras will at least make Dave Nonis' group cap compliant, but there isn't much that can be done if anyone is banged up with day-to-day injuries (like Frazer McLaren currently). The easy fix would be trading John-Michael Liles, but that's only easy if you find a magic lamp and use one of your three wishes. It's too bad the league provided every team with a magic lamp that only took care of two wishes. Dumping Liles in the minors can give some flexibility, but will only save $925,000 in cap space. Apart from a cheap minor-league call-up to take Clarkson's place, this is the Leafs team tasked with marching back towards the playoffs. After three straight seasons outside of the playoffs, and two inside the draft lottery, the Blues were a surprise six seed in 2008-09. Their development wasn't linear, however, and they missed the post-season the next two seasons before becoming one the league's powerhouses in 2011-12. But at least the Blues developed into a great team. The Avalanche are still searching for that type of success. After being one of the worst teams in 2008-09, the Avalanche shocked many the next season by gaining 26 points in the standings and making the playoffs. The next year the Avalanche shed almost all the points they gained, finishing once again in the draft lottery, a place they found themselves in 2013. Will the Leafs' playoff appearance in 2013 be an outlier like the Avalanche or the Blues? Or will they find a way to build on the success of last season and develop into a consistent winner?